The driver of a dump truck involved in a fatal crash that occurred in the 17200 block of Genito Road on Feb. 13, has been charged with involuntary manslaughter in relation to the incident. Samuel M. Allebaugh II, 57, of the 3200 block of Tanners Way, turned himself in March 28 after police obtained a warrant the same day. Police said a 1999 Ford F-Series dump truck was traveling on Genito Road when it went partially off the road, the driver overcorrected, and crossed into oncoming traffic and struck a 2009 Honda Accord. The driver of the Honda, Karen E. Giles, 56, of the 5600 block of West Creek Road in Amelia, was pronounced dead at the scene of the crash. Allebaugh, who was driving the dump truck, was not injured. The investigation indicates Allebaugh was texting at the time of the crash. 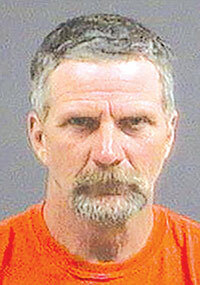 He is currently being held at the Chesterfield County Jail without bond.